We often think about how global warming will affect us in the future. Reports on how climate change will alter our lifestyle years from now is a hot topic. For example, a recent posting on Alternet from the Center for American Progress lists Top 100 Ways Global Warming Will Change Your Life. Raising awareness about how our lives will personally be affected by global warming is essential for inspiring people, governments and corporations to change their habits, policies and practices. We need to take our job as stewards of the earth seriously, and we need to do it now. But as we consider our future, our children's future, and the legacy of our planet, please let us remember that there are 500,000 people living in the Azawak of West Africa who are affected by global warming right now. Right now, the health and quality of life of the people in the Azawak are completely determined by climate. Years ago, the rainy season in the Azawak lasted 5 months. Two years ago, the rainy season lasted 3 months. This year the rainy season lasted 1.5 months. How long will the rainy season last next year? The people there live or die depending on the rains. Children in the Azawak are literally dying of thirst. 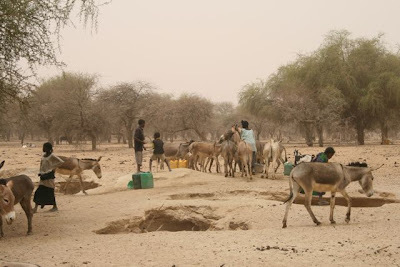 A New Green Earth, a blog that reports on environment, sustainability, climate change and global warming, tells us about The Reality of Drought and how we can support life in the Azawak and a new green earth right now through the work of Amman Imman. The future is in our hands, and change is now. Please help. to retrieve muddy water which they are happy to drink. When the rains stop, the marshes dry up. They will have to travel up to 35 miles in search of water.